Looking towards the east on an October evening we see the constellations of autumn, and can search for deep sky objects beyond. Clear, dark autumn evenings are the perfect time to begin your first explorations of deep-sky objects. But what exactly is a "deep-sky object"? Astronomers use this term to describe objects located beyond the familiar nearby stars: distant clusters of stars, nebulas (clouds of dust and gas), and galaxies. Often overlooked by casual stargazers, these are the favorite targets of experienced amateur astronomers. Some of the brightest deep-sky objects are found in the autumn skies of the Northern Hemisphere. 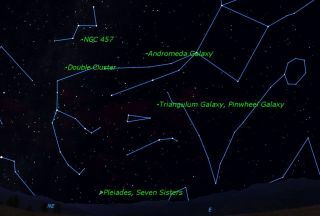 Between the square of Pegasus and Cassiopeia stretch the twin strands of Andromeda. Below Andromeda are two fainter triangles of stars. The upper triangle, dimmer and symmetrical is called "Triangulum," the Triangle. The lower triangle, brighter and lopsided, is called "Aries," the Ram. To the left of these triangles, under Cassiopeia, is Perseus, whose brightest star is called Mirfak. With these stars as guides, it is time to look beyond the stars towards the "deep sky." If you are under a dark country sky, your eyes may be enough, but a set of small binoculars will be a big help. The best binoculars for astronomy are the 7x50 and 10x50 sizes. The first number tells the magnification, the second the diameter of the large front lenses. With binoculars, look about half way between Mirfak and Cassiopeia. You'll see what appears at first to be two fuzzy stars. On closer inspection these turn out to be twin star clusters, known as the Double Cluster. Between 7000 and 8100 light years away, they appear quite different in a small telescope. Down below Aries, just clearing the horizon, is the most spectacular star cluster in the sky, known variously as The Pleiades, the Seven Sisters, or, in Japanese, as Subaru. The Japanese automobile manufacturer takes its name from this cluster, and its six brightest stars grace its logo. Seven sisters or six stars? Most people can see only six with their naked eyes, but even a small binocular shows dozens more. The Pleiades are 410 light-years away. Finally, if you have binoculars or a small telescope, there is one more star cluster to check out. Just to the right of the second star in Cassiopeia is a small star cluster, given the catalog number NGC 457. It is sometimes called the Owl Cluster, and in recent years has become known as the "E.T. Cluster" because it forms the likeness of an owl or the small extraterrestrial in the movie of that name. It is 8,000 light-years distant. These star clusters, though somewhat "deeper" than the foreground stars, are still very close by as astronomical objects go. There are much deeper targets lurking in this part of the sky. The constellation Andromeda gives its name to the nearest large galaxy in our sky, the Andromeda galaxy. Although larger even than our own Milky Way galaxy, the Andromeda galaxy is so far away that it appears as a faint fuzzy star just above the middle two stars in Andromeda. Start at the corner of the Square of Pegasus and follow the strands of Andromeda to the left. Use the two middle stars to point upwards, and there you will find the faint glow of the Andromeda galaxy. Most people need a dark night sky and binoculars to see it, but it can be seen by naked eye in a very dark sky. Oddly enough, the Andromeda galaxy is often easier to see in binoculars than in a small telescope. That is because the galaxy is so large that it is larger than the field of view of most telescopes, so that you may sweep over it without actually seeing it. The light from this galaxy has been travelling for over 2 million years to reach your eyes. In a large amateur telescope you will also see the two satellite galaxies which accompany Andromeda. They will be farther away than you might expect if you're used to seeing them in photographs. Photographs exaggerate the size of galaxies; with our eyes we see only the bright inner nucleus of the galaxy and miss the faint outer arms captured in time exposures. There is another nearby galaxy hidden in this part of the sky, known as the Triangulum or Whirlpool galaxy. For this you really will need binoculars and a sharp eye. Look just above the right "point" of Triangulum. Although quite bright, the Triangulum galaxy is extremely hard to see because its brightness is spread over an area of sky larger than the moon. Also, its loose spiral is face-on to us because its edges feather out gradually against the sky background, so there is no sharp edge to catch our eye. The trick here is to use an astronomer's technique called "averted vision." Try looking just to one side of where you expect the galaxy to be from the chart. The most sensitive part of our eyes is not right in the center, but slightly off to one side. With patience and a little luck, you should be able to spot this galaxy. Some really sharp-eyed astronomers can see the Triangulum galaxy without any optical aid in a really dark sky. You have now been introduced to two important observing techniques, "starhopping "and "averted vision." Starhopping uses bright foreground stars to locate faint background deep sky objects. Averted vision teases these faint objects out of the background. You are now ready to explore the thousands of deep sky objects which lie beyond the familiar stars.